Lancaster City moved up to second in the table by toppling league leaders Brighouse Town on Saturday. Billy Akrigg’s fine strike midway through the second half was enough to hand the Dolly Blues a 1-0 win at the Dual Seal Stadium. It was a result that knocked the hosts off top spot with five sides, headed by Farsley Celtic, now sitting on 28 points at the top of the congested Evo-Stik First Division North standings. Akrigg’s goal on 67 minutes made it two excellent away wins in a week for Phil Brown’s Dolly Blues who had also won 2-1 at Clitheroe last Tuesday night. 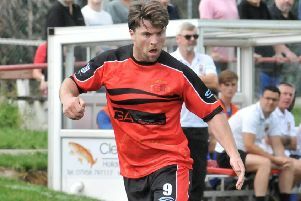 Brighouse had only lost one of their last 11 games before Saturday’s reverse while City have responded well after a mini-dip in form that saw lose at home to Ossett Town and exit the FA Trophy at Stocksbridge Park Steels. They next travel to Radcliffe Borough, 13th in the Evo-Stik First Division North, in the second round of the Lancashire FA Challenge Trophy on Tuesday night. City reached the final last year before losing on penalties to Chorley at Bolton Wanderers’ Macron Stadium.